Disney XD has unveiled series of new animated on-air IDs as that bring together a group of talented artists and animators who are helping broaden the creative voice of the channel aimed at 6- to 11-year-old boys. The new IDs coincide with an increase in animated offerings across Disney XD’s programming lineup, and reflect a closer collaboration between the channel’s on-air marketing and promotions team and the folks at Disney TV Animation. Hotchkiss’ team—led by Creative Director Vincent Aricco and Art Director John Ewart— worked with Disney TV Animation to identify the five artists, who were tasked with creating IDs that reflected the Disney XD brand and identity, but were presented in each artist’s own unique style. In the end, they tapped LA’s Tristan Eaton, BAFTA Award winners The Brothers McLeod, famed street artist Buff Monster, Disney’s Joel Trussell, and LA-based artist, animator and director Ryan Quincy. The result, according to Hotchkiss, is five unique spots that capture the energy and forward direction of Disney XD. The first five IDs are just the tip of the iceberg. 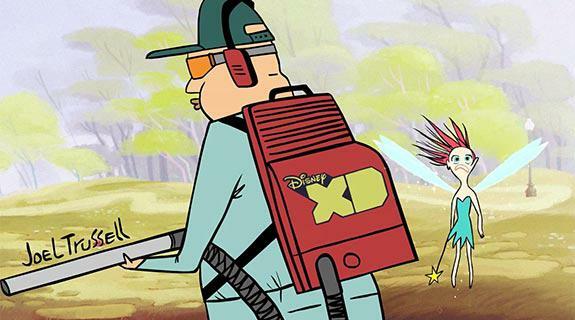 Disney XD plans to roll out a handful of new spots each quarter.